Boba, bubble tea, and khai mook are just a few of the many names for this incredible drink. Although it is quite popular in the States, I didn’t experience my first boba until I was in Thailand, and it has since played an integral part in the happiness of my life here. I’m actually feeling a bit apprehensive about returning to the Midwest and it’s utter lack of boba-ness. In Thai we call it khai mook (which means “pearl”) because that’s what the tapioca balls included in the drink are called. Popular flavors range from teas and coffee (freshly brewed) to fruits and vegetables (in powder form) which are blended with ice, non-dairy creamer and of course, condensed milk. My favorites include Thai iced tea, coffee and taro. Durian was a pretty big no and I have yet to try the corn and cantaloupe, which both seem intriguing. Above is a picture of a typical khai mook stand in our village. 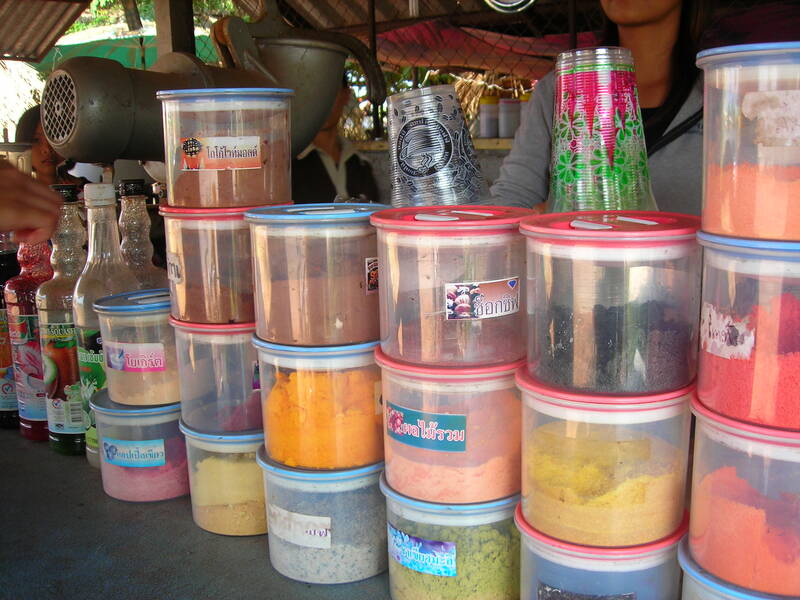 The flavors are stacked high in these cylindrical containers and until I started reading Thai, it was a bit of a guessing game to find the right one. Luckily taro is usually the only purple color! Khai mook has been our go-to treat for relief from the sweltering heat and humidity, a reward for jobs well done, as well as consolation after rough days at school. I will certainly miss this popular and utterly delicious drink.